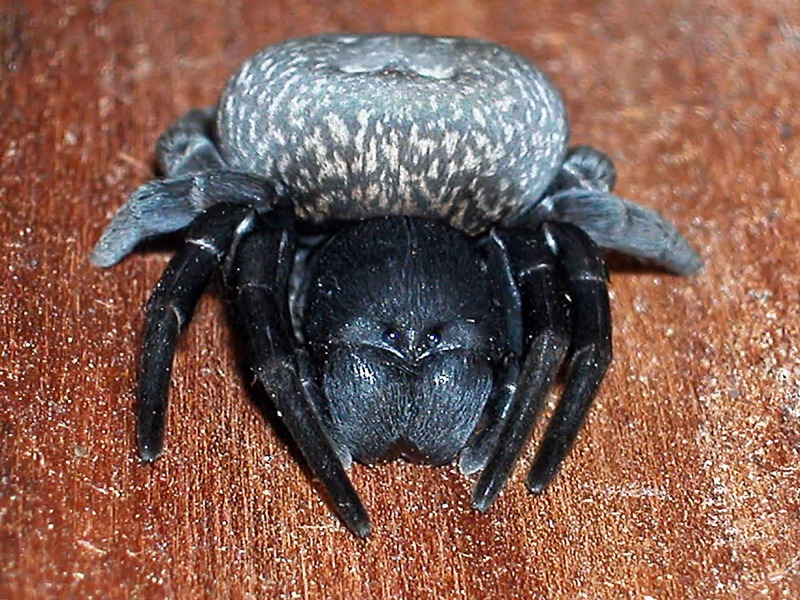 Gandanameno spenceri (Pocock, 1900), female, Monkey-faced or Velvet spider (Eresidae). Sort of cute spiders, an image of one I have set as a homepage background. Love to have one but not found in north America. Not the best photograph. It was when digital cameras were first coming out. They’re a cute looking and robust spider. Unfortunately, they’re not long-lived. Strangely, you helped illustrate something I’ve been trying to demonstrate to someone- that early expensive digital cameras weren’t as good as current cheap cell phone cameras. The pixels in this photo are weird when magnified. My newest $59 Android Oreo phone has a toggle slide for levels of flash. It shows a preview of the resulting image as the flash level is adjusted. Someday we’ll be disappointed with current photos. The photographer is more important than the equipment and you have taken great photos regardless of the camera.